Park Hours: Dawn - 10:00 p.m.
2 covered basketball courts - available for basketball events by reservation through the field coordinator. Please call (520) 724-5196. The half-size sunny court is first come, first served. 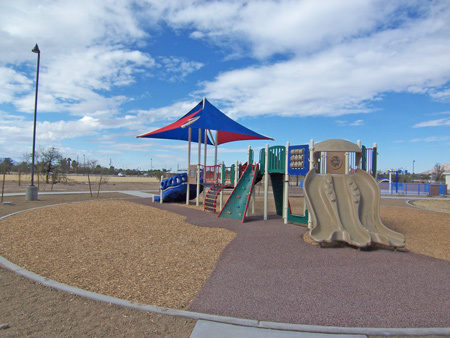 Dog Parks - Located in the east part of park, easily accessible from Dodge Boulevard. Equestrian arenas - Equestrian area is scheduled through Martina Gonzales. Please call 724-5207. Soccer fields (lighted) - Use of the three athletic fields is scheduled by NRPR's field coordinator. Please call (520) 724-5196. Splash pad It is NOT reservable. Ann Kathryn Schmidt Kickin It Clubhouse, accessible from Dodge Boulevard. Please note that Fields 1, 2 and 3 will be closed beginning May 6th through July 31st, 2019 for field restoration. NOTE: Reserving a ramada DOES NOT reserve the splash pad. The splash pad is NOT reservable. 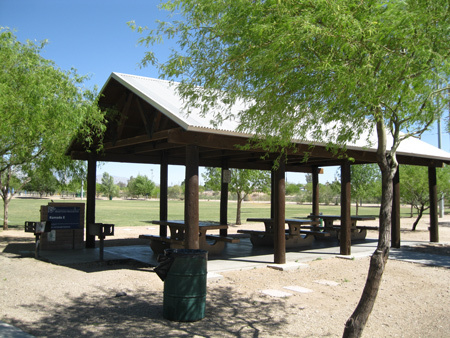 Please call Martina Gonzales at (520) 724-5207 to reserve Ramada 1, the Common Area or the Equestrian Area. Ramada 1 - At south end of commons and memorial garden. There are 2 tables but no grill at this ramada. Fee is $25 for the full day. Common Area - The commons area is $100 (up to 150 people) and $300 for groups larger than 150 people. Maximum limit on the commons area is 500 people. Ramada 6 - The ramada at the equestrian area is called the hay barn and the fee is $100 for the full day. Events Reservation Request Form Please fill out this form and fax or email back your request.